For most college students, having to pay off student loans after graduation is par for the course. For the class of 2017, the average student loan debt was $28,288, according to a LendEDU report. If graduating that deep in the hole concerns you as a parent or prospective student, know that you do have options. Using data from LendEDU, GOBankingRates compiled the colleges with the highest and lowest student debt. In Washington as a whole, the average student debt is only $23,359. This isn’t too surprising, especially because Washington is one of the states with the lowest average student debt. Appalachian Bible College is located in West Virginia, where the average student debt is $27,608. Overall, West Virginia is one of the states with the lowest tuition. It pays to go to Harvard. Not only is it one of the colleges with the lowest student debt, but it’s also one of the colleges where graduates have the highest starting salaries. Located in Pennsylvania, the average debt per student borrower in Haverford is less than half of the average debt in the state. Students in Pennsylvania graduate with an average of $36,193 in student loan debt. Brigham Young University students get a high-quality education for a relatively low cost. With tuition starting at $2,810 a semester for full-time students, it’s one of the best colleges that cost less than $20,000. The average student debt in California is $22,383, and Cal State Fullerton student debt is significantly less. But college costs are just a portion of the total costs of education in the state. The average student debt in Texas as a whole is $27,001 — nearly double the average student debt of graduates from The University of Texas Rio Grande Valley. Yale University is one of the most beautiful colleges in the U.S., and its graduates will leave with some of the lowest average debt burdens in the country. Fisher College is located in Massachusetts, which has a high average student debt for the state as a whole: $31,319. Texas Wesleyan University says its motto is “Smaller. Smarter.” Its class size lives up to that with an average of 16 students per class, and its student debt burden is also “smaller” compared to many other universities. Compared to the average student debt for the state of Georgia as a whole — $28,376 — University of North Georgia students graduate with a manageable amount of college debt. Hult International Business School is one of three Massachusetts colleges on this list, and it has the lowest student debt of all of them. 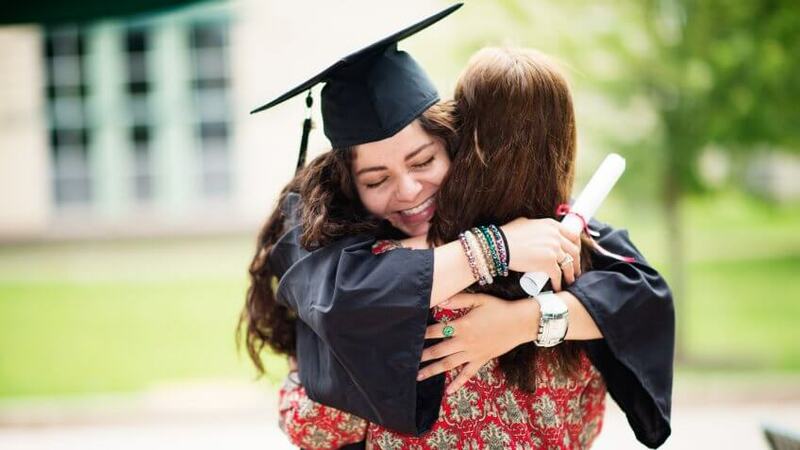 You can help pay for colleges like Hult International Business School with private student loans. Dixie State University is located in Utah, where the average student debt is relatively low — $18,425 — but it’s even lower for Dixie State graduates. Interestingly, Utah is one of the states where private school costs more than college. The average debt per borrower for Alice Lloyd College graduates is nearly $18,000 less than the average student debt for the state of Kentucky as a whole. Most New Jersey college students will graduate with over $30,000 in debt, but Ramapo College of New Jersey graduates will end up with only about a third of that. Davis College is the first school on this list where students graduate with less than $10,000 in debt, on average. The school is located in New York state, which has an average student debt of $31,506. If you need to take out a student loan, take the time to compare student loan providers. Princeton University is one of the prettiest colleges in the country, in addition to being one of the most prestigious. And graduates leave with much less debt than the average college student in New Jersey. Berea College is a small, liberal arts school located in Kentucky. Student debt is so low because the college doesn’t charge students tuition to attend; it relies on endowment income, gifts and financial aid for its funding, according to U.S. News and World Report. The average student debt in Florida as a whole is $23,556, so Florida Agricultural and Mechanical University alumni will leave school in much better financial shape than most other college students in the Sunshine State. Overall, Pennsylvania college students have more student debt than students from any other state on this list, but the Pennsylvania College of Technology bucks state trends with a low amount of debt. In Idaho, the average student will have $26,604 in student loan debt. However, The College of Idaho students have nearly $20,000 less debt than that. UNT Dallas is the only public four-year university in Dallas. In-state tuition for undergraduate students is $1,500 for the 2018-2019 academic year. University of the Incarnate Word is the Texas college that puts the smallest average debt burden on its graduates. It’s also the largest Catholic university in Texas. Located in Kansas — where the average student debt is $27,604 — Bethel College is the school with the lowest student debt. Click through to read about the most expensive high schools in America. Methodology: GOBankingRates determined the 25 schools with the 1) least debt per borrower plus 2) the average debt amount of the state in which the university is located. Data was sourced from LendEDU and represent the debt as of the 2017 graduating year. Central Connecticut State University was removed from this ranking of the colleges with the lowest student debt on Sept. 25, 2018, based on updated information provided by the university. The average private school tuition is $10,413 in the U.S.